Apple iPhone/iPad is in growing trend as an all-in-one multimedia mobile device. And as you store more and more media files such as song and video clips into it from different media sources, your iTunes library may become messy with some duplicated files that will occupy your hard disk space unnecessarily. If you wonder how to track and delete them from your database, here are some simple steps that you can follow to get it done. First, launch your iTunes. 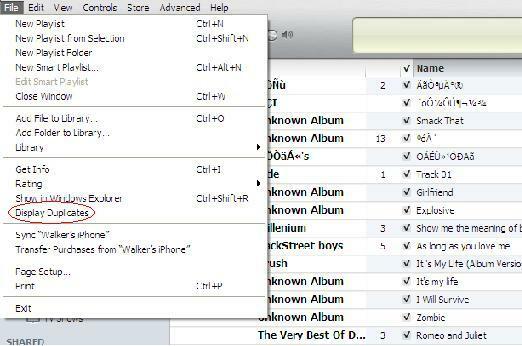 On the left pane under LIBRARY, click on either Music or Movies where you suspect that the duplicate copies may exist. Then, go to File menu and from the drop down submenu, click on Display Duplicates and it will search the whole database and filter out those duplicated copies for further action. Alternatively, press Shift key and while holding it down, repeat step 2. will allow users to click on Display Exact Duplicates that can precisely narrow down the search just in case you have too huge lists even after you tried in step 2. By now, carefully compare its Name, Time and whatever information and once you are sure that they are duplicated copies, highlight the lists followed by Delete button press will send them to recycle bin. Once completed, click on the ‘Show All’ button at the bottom of the page will bring the display back to full list. By now, you should have a cleaner and leaner iTunes library and do enjoy multimedia experience on your iPhone/iPad/iPod devices.